Power Coffee is an exceptionally effective natural energy booster that amps up focus, strength and endurance. What it doesn't do is raise your blood sugar or slam you at the end with an energy crash. Created by a doctor for his own use, gluten-free Power Coffee combines a proprietary blend of our patented Power Sugar containing Xylitol and D-Ribose, premium instant coffee and the energy vitamin B-12. Power Coffee is packaged in convenient single serving packets that are perfect for on the job, on the road . . . in the home or in the gym. Make Power Coffee your go-to energy booster. Anytime, anywhere you want to function at your ultimate best. Who Should Use Power Coffee? Is Power Coffee Safe to Use? Power Coffee is perfectly safe for most people. Containing caffeinated coffee, healthy natural sweeteners and vitamin B-12, Power Coffee is a natural dietary supplement that energizes the heart, muscles, cells and brain. It does not trigger insulin spikes or raise blood sugar. As with any dietary supplement, if you are pregnant or nursing, on medication or have a medical condition, you should consult your physician or healthcare professional before taking Power Coffee. Is there a Decaffeinated Power Coffee? Currently, no. We are looking at rolling out a decaf version of Power Coffee in the future. Does Power Coffee come in different flavors? At present, our Power Coffee contains a premium blend of French roast instant coffee. We plan to offer flavored versions of our Power Coffee in the future. The more common 6-carbon sugars include table sugar (sucrose), corn sugar (glucose), milk sugar (lactose) and honey (predominantly fructose). What are the Dangers of 6-Carbon Sugars? Power Sugar is the amazing, deliciously healthy energy booster that rapidly optimizes energy production and increases alertness, focus, strength and stamina so that you can perform at your ultimate best throughout the day. Originally created by a doctor for his own use, gluten-free Power Sugar is a patented blend of Xylitol and D-Ribose, two 5-carbon sugars that actually occur naturally in our own bodies. What are the benefits of Power Sugar? Unlike normal sugars and carbohydrates, our patented heart-healthy Power Sugar is actually good for you! Power Sugar can give you sustained energy, promote heart health and quick muscle recovery, increase alertness and intensify focus — all without the dreaded "energy" crash! How do I use Power Sugar? Power Sugar has the same sweetness (1:1 ratio) as regular table sugar. You can substitute Power Sugar anywhere, anytime you use table sugar: 1 teaspoon Power Sugar = 1 teaspoon regular sugar. Can I cook and bake with Power Sugar? Yes, indeed. You can cook and bake with gluten-free Power Sugar, using it exactly as you would regular table sugar. Xylitol won't break down with heat like some other sweeteners and has the same sweetness as sugar — with a 1:1 conversion. It's the perfect sugar-free, diabetic-friendly alternative for almost any recipe which lists sugar as an ingredient. Can I buy Power Sugar by itself? Yes. 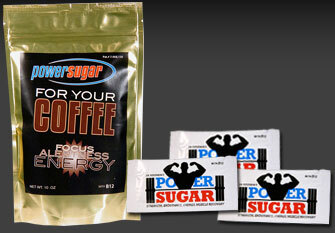 Power Sugar is available and sold separately through our website. Power Sugar is the original energy booster and signature product created and patented by Dr. Nerenberg for his own use. It is the key ingredient in all of our Power Coffee Products. You can purchase Power Sugar through our Shop Our Products section. Is Power Sugar safe to use? Power Sugar is very safe for most people to use. As with any dietary supplement, if you are pregnant or nursing, take medication or have a medical condition, it is advised that you consult with your physician or health care professional before taking Power Sugar. There are many common foods — such as coffee, chocolate, grapes, avocados, onions, garlic, salt and caffeinated beverages — that are safe for most humans but can be toxic, even deadly, for dogs. An ingredient of Power Sugar, xylitol, is perfectly safe for humans and has been approved for use by the FDA in many products, such as sugar-free baked goods, candy, chewing gum and oral hygiene products. However, xylitol and xylitol products, while a safe and healthy product for most humans, can be toxic to dogs. The FDA warns that accidental consumption of xylitol may be harmful for dogs and ferrets. Symptoms may include low blood sugar (hypoglycemia), depression, loss of coordination, vomiting, seizures and liver failure. The signs of illness may occur within 30 minutes to days of ingesting xylitol. High doses of xylitol may cause fatal liver failure in some dogs. Power Sugar and Power Coffee Products contain xylitol and should NOT be fed or made available to dogs or any pets. If accidentally ingested, take your pet immediately to a veterinarian or poison control center. Is Xylitol a drug or chemical substance? No. Xylitol is a 100% natural sweetener, which in its pure form is a white crystalline substance that looks and tastes like just like regular table sugar. With a 1:1 sweetness ratio to table sugar (sucrose) and no after-taste, Xylitol is a deliciously healthy "sugar-free" sweetener you can use anywhere and any way that you would use regular sugar. A 5-carbon sugar that is commonly referred to as a carbohydrate or a sugar alcohol, xylitol can be extracted from any woody fibrous plant material. Commercially, it is extracted from corn cobs and hardwood. Xylitol occurs naturally in berries, fruit, vegetables, mushrooms and our own bodies. An average size adult during normal metabolism can manufacture up to 15 grams of xylitol daily. How does Xylitol compare to other sugars and sweeteners? What are the main benefits to Xylitol? Is Xylitol safe for me? Xylitol, referred to as a "sugar-free" sweetener, a carbohydrate or a sugar alcohol, is perfectly safe and healthy for human consumption. The FDA has approved Xylitol for use in many common products, including candy, sugar-free baked goods, oral hygiene products and chewing gum. Is Xylitol toxic for dogs? Yes. The FDA cautions consumers about the risks associated with the accidental consumption of xylitol by dogs and ferrets. Xylitol can be harmful to dogs if ingested, causing illness and in some cases, may be fatal. D-Ribose is an amazing 5-carbon "super sugar" that is heart-healthy and naturally occurs in our own bodies. It is a natural energy producer, converting the special energy molecule ATP that powers our brain, supports a healthy heart and skeletal muscle, increases strength and stamina, fights free radicals, and combats fatigue. What D-Ribose does not do is raise blood sugar levels or cause diabetes. While normal healthy heart and muscle tissue will make the ribose it needs, it is not a fast process. When our natural ribose supplies are depleted from over-exertion in exercise or are super-stressed by life, illness or professional demands, extra D-ribose can help boost energy production to increase our energy naturally. Has D-Ribose been tested in clinical trials? Yes. D-Ribose has repeatedly been shown in clinical trials, medical studies and scientific research to stimulate energy recovery in energy-deficient hearts and muscles, as well as lowering blood sugar temporarily, helping in cellular energy production and combating fatigue. D-Ribose is one of the few natural nutrients to be used first by physicians before moving into the mainstream supplement companies and health food stores. The statements on this page have not been evaluated by the Food and Drug Administration. These products are not intended to diagnose, treat, cure or prevent any disease. As is the case with any supplement, it is recommended that you consult with your physician or a healthcare professional before taking Power Sugar or our Power Coffee Products.